Bacteria and Nuclear Weapons: The Boundaries of Our Existence – Patrick F. Clarkin, Ph.D. In his 1997 book “Full House,” the late paleontologist Stephen Jay Gould discussed the idea of progress in evolution. He noted that Darwin went back and forth over the idea, at times arguing that natural selection had the power to refine organisms and “tend to progress toward perfection” and at other times writing that “after long reflection, I cannot avoid the conviction that no innate tendency to progressive development exists” (p. 137 and 141). 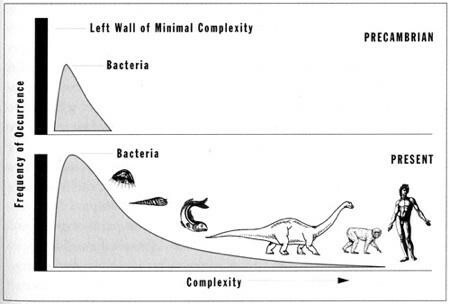 Gould argued that the solution could be found by acknowledging what he called “the left wall of minimal complexity.” It is certainly true that large multicellular organisms with big brains necessarily cannot precede small, simple unicellular ones over evolutionary time. However, that doesn’t mean that life was ‘trying’ to become larger or more complex. Instead, Gould’s point was that since life started at a minimal complexity, it simply had nowhere else to go. After all, some (hypothetical) subatomic form of life cannot be built out of molecules. Therefore, complexity need not be automatically advantageous; it could be merely accidental, a byproduct of time and chance. Gould went on at length about how we are blinded by our anthropocentric, animal-centric bias that we often overlook the fact that our planet’s biosphere is still comprised largely of bacteria. Life did not give up on its simplest forms; it merely dabbled in a (relatively) smaller number of eccentric multicellular species. But those are the ones we care about the most. A recent study confirms Gould’s basic point – that bacteria make up most of the variety of life, and that the eukaryotes (which includes us, other animals, plants, fungi and protozoans) form a relatively small branch on the tree of life. In his write-up of the study, Carl Zimmer noted that by staying small and keeping a simple metabolism, bacteria had kept a “winning formula” in life – exist, survive, reproduce. That formula is so good that some bacteria even seem to be able to survive being frozen for hundreds of thousands of years (at least), after which some can be reanimated. The tree of life. 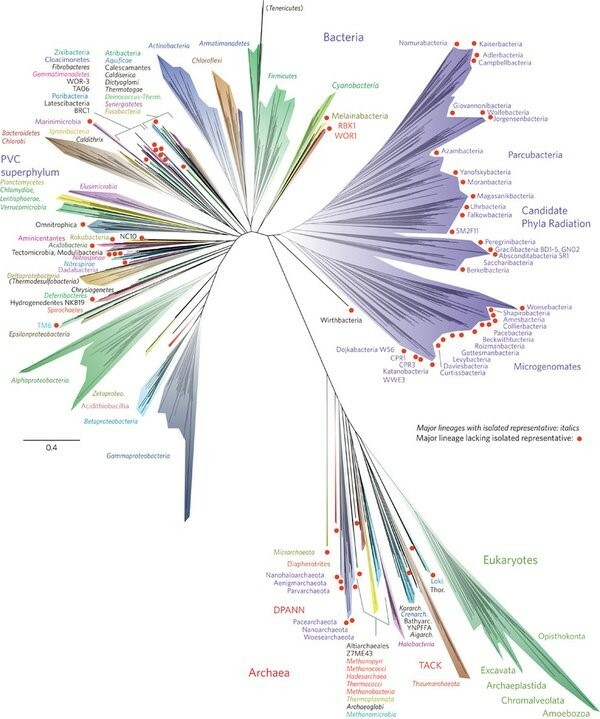 “The new tree of life that researchers published on Monday. It shows that much of Earth’s biodiversity is bacteria, top, half of which includes “candidate phyla radiation” that are still waiting to be discovered. Humans are in the bottom branch of eukaryotes.” Source. I think Gould’s concept of a “left wall of minimal complexity” is useful and can be transferred to other phenomena. We can also look at its inverse. Instead of going from simple to complex, we can go from flawless to degraded – a “right wall of perfectionism.” We have lower and upper boundaries to our existence. In the same way that the simplest forms of life cannot be made any simpler, then the healthiest bodies cannot be any healthier; the most peaceful periods of history cannot be made any peace-ier; and the most efficiently running societies cannot be any more efficient. Time is not kind to most things: bodies, civilizations, computers, species, ice caps, relationships, planets, memories, businesses, mountains, roads, etc. Things fall apart. I can think of one important way in which this concept might apply to our lives – the existence of nuclear weapons (or any weapon, really). In the documentary “The Fog of War,” Robert McNamara warned that “The indefinite combinations of human fallibility and nuclear weapons will lead to the destruction of nations.” Simply by existing, the use of nuclear weapons becomes almost inevitable. The idea that they can remain inert forever bumps up against the right wall of perfection. Statistically, there is nowhere else to go except to be used, whether accidentally or deliberately. We’ve been warned. Gould SJ. 1997. Full House. Harvard University Press. This entry was posted in Cooperation and conflict, Evolution and tagged Bacteria, Left wall of minimal complexity, Nuclear weapons, Right wall of perfection, Robert McNamara, Stephen Jay Gould. Bookmark the permalink.